Imagine that you are sitting in front of a group of teens and no one is talking. What can you do to get the conversation started? Icebreakers can help fill the awkward silence, allowing teens to get to know one another and encouraging participation before you delve into the deeper subject of your lesson or call the group together to focus on other tasks. Most people who work with youth, whether they are youth group leaders, scout leaders, coaches or with organizations, have very limited budgets, so finding icebreakers that require no materials is essential at times. If you are using a pre-packaged curriculum or have a book from your organization, it may contain ideas for icebreakers you can use with your group. However, the packaged icebreaker that resonates with one group of teens may fall flat with the next. On these occasions, it is important to be ready to step in with a tool or two and get teens talking. There is nothing quite so rattling to a leader or teacher as a room full of students who will not speak or get involved in the lesson. Icebreakers can get them started, so they will want to keep talking. Would you rather eat worms (A) or sardines (B)? Would you rather watch a romantic movie (A) or a horror movie (B)? Would you rather have ketchup (A) or mustard (B) on your hamburger? Questions that are fun tend to get students talking. When using questions as an icebreaker, you will want to go around the entire room rather than waiting for volunteers to speak up. This gets everyone involved. However, if you are going to make students participate, the questions should be simple and easy to answer. If your group likes to play games, this can get everyone involved and is a lot of fun. Choose one player before class starts to be a killer. 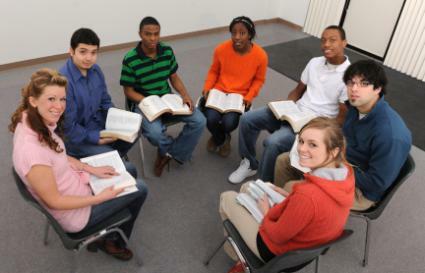 The teens all sit in a large circle and stare at one another. The kidsmust make eye contact. The killer winks at different members. When the member sees the killer wink, she should die dramatically. The louder and sillier the death, the funnier this game is. Allow students to gasp, fall out of their chairs onto the floor and be completely goofy. The goal is for those still alive to figure out who the killer is before he winks at them. Tell the students that you want them to line up against the wall in the order of their birthdays, so that the order goes from oldest to youngest. However, they cannot speak to one another to figure out when their birthdays are. The students will try different things like charades and writing to figure out the order. This teaches them to cooperate with one another and also gives them a chance to learn something about the other people in the group. In very large groups, you can choose to have them go from tallest to shortest or by largest to smallest shoe size to save time. You may also want to use items that you have on hand. While this will technically require materials, it does not require purchasing anything special to break the ice. For example, make up cards out of scrap paper that have numbers on them and then ask students to arrange themselves into numerical order. You don't need fancy materials and commercial games to get students involved. Your imagination can go a long way. Think of any topic that might interest teens and show them what they have in common with other students in the room. You can even use pizza as an icebreaker when you tell the pepperoni lovers to head to one side of the room and the pizza with everything crowd to head to another. Try to use icebreakers that will also involve those kids in the group that might be shy or may not know anyone else, and you're sure to have a successful class.